Because of its unmistakable Pavement influence, Speedy Ortiz will always have slacker terminology attached to it. Yet it’s that descriptor that discredits just how deliberate the band’s songs have been since its inception. It’s those references to slacker rock that make Foil Deer’s first single, “Raising The Skate,” work to correct the dialogue surrounding it. When the chorus opens up and vocalist Sadie Dupuis proclaims, “I’m not bossy / I’m the boss,” it’s one of the album’s many feminist declarations that also doubles as a middle finger to anyone who has devalued the band’s intent. 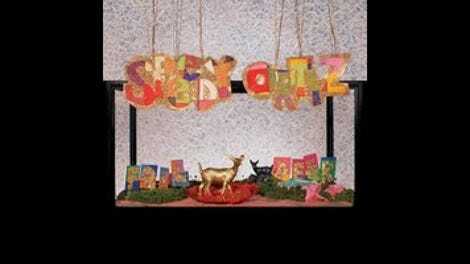 Lyrical proclamations aside, Foil Deer fits nicely into Speedy Ortiz’s catalog. “Dot X” is a dead ringer for a song off its debut, Major Arcana, as Dupuis’ and co-guitarist Devin McKnight’s riffs spill over one another like they’re competing to write the best hook. Even though this album marks McKnight’s first appearance on a Speedy Ortiz recording, his interplay with Dupuis on “Dot X” seems second nature, as they flaunt their knack for making precision sound effortless. But the two are just as quick to replace these knotty fretboard runs with massive chord strikes that squeal with menace, making songs like “Homonovus” and “Swell Content” more conventional but no less effective. Though it’s an album that revels in progression, Foil Deer’s biggest sonic departures all feel like half-measures. In certain cases, like the rising synths in “The Graduates,” the band uses auxiliary instruments to add to its tightly wound neuroticism without muddying the proceedings. But it’s “Puffer” that signals Speedy’s biggest break from tradition, and also its most confused creation. Opening with drumsticks cracking against metal hardware and the electronic thunk of a drum pad, it’s a hip-hop track that never commits to its premise. Using the chorus as a way of returning to the band’s standard fare, “Puffer” misses the mark, as Speedy Ortiz opts to play it safe when it should have given itself fully to the experiment. By its end, Foil Deer asserts itself as a collection of some of the band’s best songs and some departures of varying quality. Even if Speedy Ortiz isn’t afraid to take chances, its strength still lies in ’90s-minded indie rock that’s become its calling card. For the slackers of the world, that’s good enough.